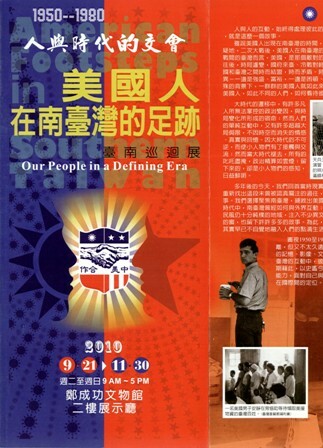 This exhibition at Tainan is sponsor by AIT. AIT is The American Institute in Taiwan. We often call AIT is U.S. Embassy on Taiwan. This time I try to introduce the exhibition at Tainan, that contains the pictures about Mr. Valery S de Beausset, who is the Taiwan manager of The J.G. White Engineering Corporation, during 1949~1957. 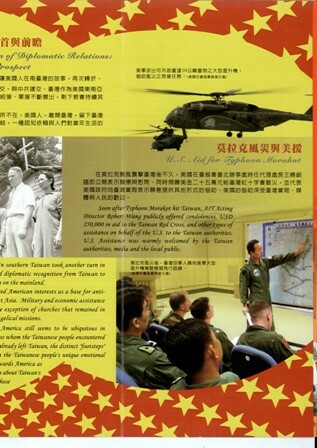 The most important era that USA Aid to Formosa. Mr. Valery S de Beausset and J.G. 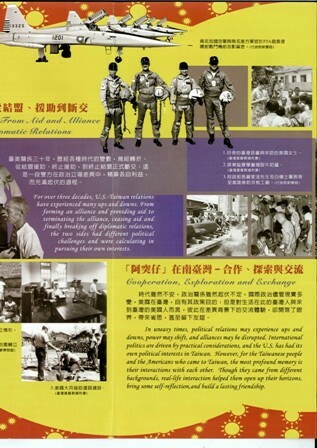 White work hard and successful to prevent the Communist invasion of Taiwan. Valery S de Beausset and US Aid to Taiwan is 11 rolls motion pictures, that took by Mr. Valery S de Beausset, during 1949~1957. Now, the original 11 rolls motion picture is keep in Taiwan University Library, and this Library transfer into DVD format. Valery S de Beausset and US Aid to Taiwan, first story is the Library researcher Ms. Hung Shu-fen(洪淑芬), she call on Mr. de Beausset at 2006. In the picture, Mr. de Beausset and Mr. White are memory the past time. Mr. White is retired from US Air Army. Second story are four pictures, left up is break ground at Taiwan-power site, right up is Mr. de Beausset, left down is Mr. de Beausset and Chiang Ching-kuo at Cross – Island Highway, right down Mr. de Beausset family picture. Third story is the cover of Valery S de Beausset and US Aid to Taiwan DVD. Forth story is the pictures of Mr. & Mrs. de Beausset, Mr. de Beausset family picture, Taiwan Glass Co. break ground and Mr. de Beausset, presented a banner to Mr. de Beausset, Mr. de Beausset went to Tatung Co. and the president of the board of Tatung Co. accompanying. My friend Mr. Kai-shao Chen went to watch the exhibition and took pictures for me. Thanks a lot. In his Blog, he has a lot of pages to show Valery S de Beausset and US Aid to Taiwan. You can watch the BLOG of Mr. Kai-shao Chen. 本文發表於 2010-11-04 at 10:27 上午 且歸類為 台灣, 台灣獨立與社會運動, 林炳炎, 科技史與文化, 美援. 你可以發表回應於 RSS 2.0 feed. 你可以 留下回應, 或 自你的網站引用. This youtube has English presentation. Mayor Chen delivered her speech. This picture shows 3 images. Left is an old underwear pants, used the flour bags sewing. Due to that time, too many refugees poured into Taiwan, lack of clothes, fabrics, food and place of residence. Middle is flour bag. Right is old picture, show the difficulties of living. At that time, 1949~1960, my family received relief materials from the church, such as flour, milk powder, butter cans, food cans and old clothes. We are happy for weeks. You know, my mother teach in public elementary school and my father was a political prisoner, held in Green Island. From the above, everyone is going to understand Mr. V. S. de Beausset do the most important work in Taiwan–USAID. November 4th Thursday is Thanksgiving Day. When I was a high school student, my friend finds an American Reader for us to learn English. In this book, it has the Mayflower history and Thanksgiving Day. At 2003 Thanksgiving Day, I flied to Detroit to Gross Ile. I try to report my work to Mr. & Mrs. de Beausset. That’s my first Thanksgiving Day experience. Why I choice Thanksgiving Day to call on Mr. & Mrs. de Beausset? I was born at 1944 and Mr. & Mrs. de Beausset married at 1944. I went like a child of Mr. & Mrs. de Beausset, for reunion. At 2004 Thanksgiving Day, I published the book : V.S. de Beausset’s Order of Brilliant Star. I went Gross Ile, for reunion, too. I cannot use English to write my feeling well. But at Gross Ile, I am very happy for I do a lot work for Taiwan. I try to say that Every Taiwanese need to Thank Mr. & Mrs. de Beausset for they do a lot work for Taiwan. The maple is tree at de Beausset garden, I still remember it. When I use Google earth to watch Gross Ile, I know my footstep on it. So, the picture on this column is my favorite.